10:45 Welcome back to AUTOSPORT Live as we continue to follow the opening day of practice at Istanbul Park in Turkey as the teams and drivers continue to find a balance, grip - and in some cases, the tyre barriers. 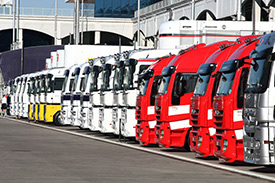 The sport has set out its stall for the seventh round of the 2010 season, with everyone aiming to catch the flying Red Bull team. But the championship-leading outfit is keen to stay on top with the introduction of its F-duct this weekend. Turn 8 has provided Disneyland-style thrills for the drivers once again and Adrian Sutil found out the hard way when he understeered off the road and subsequently crashed. Others will be hoping not to go the same way as the German in today's second practice session, as the tyre comparison, fuel load and set-up work continues ahead of Sunday's race. 10:47 Lewis Hamilton topped an extremely slow-starting session this morning as several teams sent drivers out on multiple runs to rigorously check over recent car updates. Following half-an-hour of that, F1 returnee Sakon Yamamoto started the show while his HRT team-mate Karun Chandhok took the racing equivalent of a slow morning stroll round the circuit. 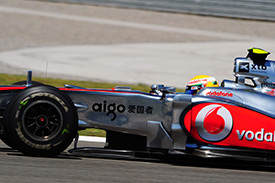 Gradually, more and more drivers emerged to check the track conditions, but soon McLaren drivers Hamilton and Button took control with laps under 90 seconds. Michael Schumacher led his team-mate Nico Rosberg for a Mercedes three-four by the end of the session, with Sebastian Vettel fifth and Robert Kubica rounding out the top six. 10:49 Weather conditions remain fine and bright at Istanbul Park this afternoon and the temperature gauge is climbing towards the 30 degree mark. Track temperature is on the increase too, with close to 50 degrees expected in the prolonged sunshine, giving the teams and Bridgestone tyre technicians a lot to think about. 10:51 Motor racing enthusiasts love to debate and discuss the action on track, and the live forum at the bottom of the screen is your chance to let everyone know your thoughts on events as they unfold at the circuit. • Will the McLaren pair stay on top in the second session? • Williams drivers Barrichello and Hulkenberg appeared to struggle with the old specification front wing, ending up almost three seconds off the pace. Do you see either driver finishing in the points this weekend? • Will anyone fall foul at Turn 8 this afternoon? • Adrian Sutil's heavy crash at Turn 8 in the closing stages of first practice left the Force India team with a lot of repair work to do, particularly on the right front suspension. The squad, is evaluating a new F-duct concept rear wing here, reported that Sutil had understeer in the tricky, multi-apex corner - slewing off the road as he lost grip on the discarded rubber building up on the outside of the bend. • Davide Valsecchi topped the first GP2 practice session for iSport, with his benchmark time of 1m36.021s fractions quicker than Yamamoto managed for HRT in F1 practice earlier. 10:55 Free practice resumes at Istanbul Park in five minutes. 10:56 It is a hot afternoon at the Istanbul Park circuit with the asphalt now a scorching 50 degrees. 10:57 As we approach the start of the session, work continues down at Force India on Adrian Sutil's crashed car. The German won't be out for the first half of the session. 10:58 Changes also at Hispania. Bruno Senna takes over at the helm following Sakon Yamamoto's outing this morning in first practice. 10:59 Jarno Trulli is ready for action in his Lotus. The team will be buoyed by its pace being reasonably close to some of the midfield teams so far. 0 min: Bruno Senna answers the call immediately and he joins the racetrack for the first time today. 1 min: Senna has the track to himself in the early stages as the rest of the field waits for circuit conditions to improve. 2 min: Karun Chandhok joins his team-mate on track as Hispania looks to get some early laps on the board. 2 min: Senna crosses the line to begin his first timed lap. 2 min: Kobayashi is also on track in his Sauber, along with Petrov in the Renault. 3 min: Power-induced oversteer for the Brazilian as he rounds Turn 7 heading towards the thrilling eighth corner. Senna keeps control and is proceeding towards the end of his first effort. 3 min: Senna completes that tour with a time of 1m37.906s. 3 min: Kubica in his Renault and the McLaren pair are all out for some early running on the harder tyres. 4 min: Tonio Liuzzi is also on track as more drivers come out for an early short run. 5 min: Kobayashi is now between the HRT pair at the top of the early order. 5 min: Jaime Alguersuari and Rubens Barrichello are on track to continue with set-up work, as Chandhok goes to the front with 1m34.744s. 5 min: Petrov makes a step forward with the benchmark time as he clocks a 1m30.049s. 6 min: Kobayashi, meanwhile, has been off road at Turn 8 but managed to keep his Sauber out of the barriers after losing control of the rear. 6 min: Senna improves on his second timed lap but as others put laps on the board he is already sinking down the classification. 7 min: Barrichello goes third behind Hamilton and Petrov with a lap of 1m31.517s in the Williams. 7 min: Hamilton crosses the line to take the top time, but it is quickly beaten by Kubica in 1m29.558s. 8 min: At Force India, Sutil's car is back down on the ground as the work nears completion following his crash at Turn 8 this morning. 8 min: Jaime Alguersuari slots in sixth quickest after his first effort of 1m32.117s. 8 min: Petrov is now third quickest in his Renault, while both Button and Hamilton are on improving laps. 8 min: Button takes the top time with a 1m29.399s but Hamilton looks set to be quicker. 9 min: No move yet from either Mercedes or Red Bull drivers. They are waiting for others to clean up the circuit before they continue with their respective programmes. 9 min: Bruno Senna runs wide and onto the run-off area briefly exiting Turn 1 as he looks to push the limits of the HRT as quickly as possible. 10 min: Senna continues without any apparent damage. He has slipped down to 13th in the standings. 10 min: Nico Rosberg leaves the pits for a first run in the Mercedes. 11 min: Kubica splits the McLaren pair with a 1m29.284s effort. Team-mate Petrov is fourth quickest. 11 min: Karun Chandhok is back into the pits after a run of three timed laps. He is 13th currently, 4.6 seconds off Hamilton's pace. 11 min: Tonio Liuzzi puts a 1m30.773s lap on the board to slot into sixth at the moment. 12 min: Button is the next man to top the times as he clocks a 1m28.931s in the McLaren. 12 min: Kobayashi pits to end his first run, which is so far fifth quickest this afternoon. 13 min: Once again we have the McLaren duo leading the pack with Kubica third, Petrov fourth and Kobayashi fifth after 13 minutes. 14 min: Michael Schumacher joins the action in the Mercedes as his team-mate Nico Rosberg comes in and then out of the pits as the extensive tests of the F-duct continue. 14 min: Alonso clocks the 10th quickest time as he works on Ferrari's traditional heavy-fuel approach to second practice. 16 min: Still no move yet from the Red Bull drivers, but the reason for Vettel maintaining station in the pits may be more sinister than just waiting for track conditions to improve. The mechanics are busy working around the radiator area of his RB6. We will look to see when he eventually comes out. 16 min: Hamilton is now 10 thousandths of a second quicker than team-mate Button at the top with a 1m28.921s effort. 16 min: Schumacher posts 1m29.328s to go fourth quickest ... and then runs wide at Turn 1 onto the asphalt run-off area. He backs off and continues. 17 min: Hamilton's next effort is much quicker, with the fastest second and third sector times for a 1m28.692s to extend his advantage at the top. 18 min: Nico Rosberg has been out on the circuit twice, completing four laps but has yet to set a time. He emerges for the third time to begin another lap out of the pits. 18 min: The tyre covers come off at Red Bull and Mark Webber is given the all-clear to join the action. 19 min: Webber trundles down the pitlane and out onto the circuit. 19 min: Sebastien Buemi is on an improving lap in the Toro Rosso. He moves up from 12th to ninth with a time of 1m30.793s. 20 min: Pedro de la Rosa has had a leisurely start to the session but slots in seventh quickest with a 1m30.573s. 20 min: On-board with Rosberg, we can hear that he is still continuing with the straight line aero tests that we saw a lot of this morning. 22 min: Webber is now on his first flyer of the afternoon. He negotiates traffic in the form of Massa on his way to 1m30.476s and sixth place. 24 min: On board with Webber, the sound of the Renault engine is mighty as he keeps his foot in through the challenging Turn 8. 25 min: Webber is now testing the F-duct after running without it earlier in the first session. From the on-board shots he appears to be operating the duct with his left hand in the cockpit. 25 min: Hard tyres remain the choice of the field for now, with engineers waiting for a little longer before moving to some runs on the softer tyre. 26 min: Webber improves to third place with a lap of 1m29.058s - featuring a fastest second sector time. He has completed five laps so far. 27 min: Sebastian Vettel is finally out for a run in the second RB6. The German is on his first timed lap. 27 min: Immediately Vettel is right on the pace. He comes through in 1m29.174s - good enough for fourth. 29 min: Rosberg completed another two lap run without setting a time as the testing at Mercedes continues. He has logged six laps in all so far. 29 min: De la Rosa is advised on the radio that the tyre seems to give its best on the first lap, with another chance for pace after a couple of gentle laps. There is unlikely to be trouble warming the rubber with such high track temperatures here. 31 min: Pacesetter Hamilton is heading out for another run on hard tyres. 31 min: Vettel posts his quickest lap of the session so far - 1m28.976s. He is third to Hamilton and Button, with team-mate Webber in fourth. 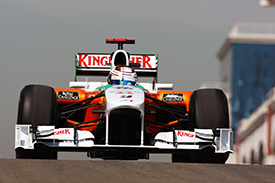 32 min: The repairs are complete at Force India and Adrian Sutil joins the racetrack for a run. 34 min: Hamilton is currently catching Senna's HRT, which is circulating six seconds off the pace. 36 min: The track is quite busy at the moment, with Alonso pulling past Chandhok's HRT while Hamilton is finally clear of Senna. 36 min: Tonio Liuzzi is pushing hard to improve on tenth place and indulges in a graceful half-spin sideways slide at Turn 8. He continues. 37 min: Sutil's first timed lap places him 12th with 1m30.816s, just a couple of tenths shy of his team-mate. 37 min: Massa has also had a minor moment at Turn 8 but continues without much trouble. 38 min: Interestingly, Nico Rosberg hasn't been seen since those early installation-type runs in the early stages of the session. 38 min: Rosberg is the only driver yet to post a time on the board this afternoon. 38 min: Problems for the Williams team with Hulkenberg's car: "Hydraulic leak on the Hulk's car has stalled his session temporarily"
39 min: Michael Schumacher is back on track and improving his pace, as Sutil goes ninth with 1m30.234s. 39 min: Schumacher improves to fifth spot with a lap of 1m29.107s. 40 min: Tonio Liuzzi is having trouble again at Turn 8. He understeers wide onto the asphalt run-off area. This time he pits for adjustments. 40 min: Kobayashi sets his best time of the afternoon with a 1m30.053s in eighth quickest. Team-mate de la Rosa is currently ninth. 41 min: Schumacher is back into the pits after that brief run that saw him move up to fifth. But still no sign of his team-mate Rosberg. 42 min: Mike Gascoyne also reports mechanical gremlins for Trulli: "Jarno stopped with a damaged 3rd gear"
43 min: Massa pits after a long run on the harder tyres. He is currently 16th, with team-mate Alonso 14th. 44 min: Now there is movement at Mercedes. Nico Rosberg leaves the garage and joins the racetrack. Perhaps this time he will put a lap on the board. 45 min: Rosberg completes his lap out of the pits, crosses the line and launches into what we hope is a timed lap. 46 min: This is a good lap so far from Rosberg. His first two sectors are bang on the pace. He comes through and goes sixth with 1m29.154s. 47 min: With Rosberg finally setting a time, the Virgin pair are now propping up the field and have been unable to match the HRT drivers so far this afternoon. 47 min: Rosberg's first effort is less than half-a-second shy of Hamilton's best time so far. 48 min: Karun Chandhok reports on the Hispania team radio that his car is bottoming through the high-speed apexes of Turn 8. He is 22nd so far. 49 min: Rosberg was not able to improve on his second timed lap and remains in sixth position. 49 min: Hamilton is now out to test the softer tyre on his McLaren. 49 min: Onto his third flyer and Rosberg lights up the timing monitor through the first sector, although he drops some time to Hamilton in the second portion of the lap. 50 min: Rosberg crosses the line with no overall improvement in lap time and he remains sixth. 52 min: But Vettel is out there as well on the softer tyre. He is matching Hamilton through the sectors and he goes fastest with 1m28.590s. 53 min: Great that two of the leading contenders came out on the option tyre at the same time. The difference between Vettel and Hamilton is 0.082s. 53 min: The pair will now head in to a long run on these softer tyres to see how they cope over a series of laps. 53 min: Michael Schumacher is out again in the Mercedes. He is currently fifth on a 1m29.107s. 53 min: Alonso is also out to test the softer rubber. 54 min: Alonso goes third quickest with a 1m28.725s but expresses his frustration at catching Schumacher's Mercedes in the final complex. 55 min: Button is also testing the softer compound on his McLaren. 55 min: Schumacher is on a hot lap and set to improve in tandem with Button. 56 min: Button had set the fastest first sector but a wobble in Turn 8 doesn't stop the world champion topping the times in 1m28.280s. 56 min: Schumacher posts 1m28.974s. He is back into fifth spot but almost seven tenths of a second down on Button's time. 57 min: Mark Webber comes out for another run in the Red Bull. He has slipped to sixth following the rash of soft tyre improvements. 58 min: Felipe Massa was on his soft tyre test but is again off the road at Turn 8 - this time with a major slide sideways across the run off. 59 min: Michael Schumacher was on a hot lap, posting a personal best first sector time, but he came across the recovering Massa and was forced to back off. 60 min: Massa's set of soft tyres are now ruined and he returns to the Ferrari garage. 60 min: A nice moment as Schumacher glanced across to take a look at which Ferrari driver had inadvertently halted his progress. Seeing that it was Massa instead of Alonso, he continued without seeking to pay back the gesture. 61 min: Schumacher returned to the pits after that moment, to end what was another short run of laps. He remains in fifth spot. 62 min: Down at the back of the field, Kovalainen clocks his best time of the afternoon to close within half a second of Barrichello's Williams. 62 min: While the Massa incident was occurring, Mark Webber quietly moved up to second place behind Button with a lap of 1m28.464s. 63 min: Webber improves again on his next lap to move to within one-tenth of a second of Button. Vettel is now third with Hamilton dropping to fourth. 64 min: Both Virgin drivers are back on the circuit but the pair remain well behind the HRT duo at the bottom of the times. 65 min: Now it's Nico Rosberg's turn to test with the softer tyre. He rounds Turn 8 and blasts downhill towards the final corners of the lap. 65 min: Rubens Barrichello is also out on a soft tyre run. He improves to 14th quickest with a lap of 1m30.766s. 66 min: Massa has now slipped to the slowest of the established teams' drivers in 18th and will have no fresh rubber for the rest of the session. 66 min: The top six drivers are all in the pits at the moment. Button leads the pack from Webber, Vettel, Hamilton, Alonso and Schumacher. 67 min: Rosberg moves up a place from seventh to sixth with a time of 1m28.946s. 68 min: Sebastien Buemi is unhappy as he circulates in the Toro Rosso. He reports that his soft tyres are worn out. 69 min: The Sauber pair remain well-placed with Kobayashi 10th and de la Rosa 11th quickest this afternoon. 69 min: But funnily enough, Buemi crosses the line to set his quickest time of the session so far! 1m30.386s has the Swiss in 13th. 70 min: Kobayashi, however, has taken another wild ride around the Turn 8 rollercoaster but this time avoided the run-off. 71 min: The hydraulics issue has been resolved at Williams and Nico Hulkenberg comes out to resume his Friday programme. He is 16th. 71 min: Massa has resumed but is on his used set of harder tyres. The limited tyre allocation for practice means he is unable to get on fresh tyres. 72 min: Information crackles through the Red Bull team radio that Sebastian Vettel is losing water pressure - not great news on a 30-degree day. 72 min: Massa has still found the speed to lift himself up the order, going 10th with a 1m29.798s. 74 min: Karun Chandhok's car is up on stands as the mechanics work on major problems. He is 23rd in the standings. 74 min: Glock has finally cleared the HRT pair with a 1m33.312s effort in the Virgin, five seconds off the pace in 21st. 74 min: Nico Hulkenberg has improved with 1m29.987s to slot into 11th place as his second run of the afternoon continues. 75 min: Hamilton is back out with the soft tyres on his McLaren for another look at race durability. 76 min: Michael Schumacher is back on the circuit for another run with just under 14 minutes left in the session. He is seventh currently. 77 min: Red Bull seems satisfied with the workings of Vettel's car at the moment. He goes back out for another run of laps. 77 min: Alonso is also out running on his used soft rubber. 78 min: Di Grassi has gone one better than team-mate Glock and split the Lotus pair, although Trulli has been in the garage for some time with gearbox gremlins. 80 min: Rosberg improves in lap time to a 1m28.914s as he continues on a soft tyre run, but remains in sixth position, more than six-tenths off the pace. 82 min: Senna's HRT continues to provide the traffic, with Vettel, Kubica and Webber recently passing the HRT. 83 min: At the foot of the table the gaps are closing. Lucas Di Grassi is 20th on 1m33.013s, but only seven-tenths of a second cover the bottom five. 83 min: As is typical for the end of this session, there is no improvement in headline times as drivers lap on used tyres with heavy fuel. 85 min: Sebastien Buemi is less than thrilled with Karun Chandhok's choice of line through the middle sector of the lap. The Swiss gives the HRT driver a despairing wave as he attempts to pass. 86 min: First it was Vettel, and now Webber. The Australian has stopped on the circuit with problems at the rear of the car. 86 min: Webber effortlessly reversed the stricken car down the hill to an access point. His session is over. 87 min: Replays showed a light wisp of smoke coming from the back of the Red Bull. From on-board, we could hear a sudden loss of power. 88 min: Mark is getting rapidly agitated with the marshals as he seeks their assistance. He wanted them to chock the front wheel to prevent it rolling down the hill any further, so he could get out of the car safely. 90 min: There are no signs of improving laptimes as the session reaches its conclusion. 12:30 The penny eventually drops and they secure the car. Webber climbs out and is sitting watching the world go by from the marshals post. 12:31 Drivers will once again head around to make practice starts from the grid as there is no space here to practice launches in the pits. 12:31 Karun Chandhok spins at Turn 8 and sees lots of Turkey rotating round his head. The HRT comes to a stop and he continues without any visible damage. 12:33 Jenson Button ends the second session on top at Istanbul Park. His lap of 1m28.280s is 0.098s quicker than second placed Mark Webber. 12:34 Sebastian Vettel finishes the day in third spot, ensuring a strong Red Bull presence at the top of the standings. Lewis Hamilton was fourth. 12:34 Fernando Alonso puts Ferrari in fifth, ahead of Nico Rosberg and Michael Schumacher. 12:35 Robert Kubica was eighth - just over nine-tenths of a second down on the quickest time. Petrov was ninth and Massa rounds out the top ten. 12:36 Vettel is the last man back in the pits this afternoon, rounding out the first day of practice in Turkey. 12:39 So it's McLaren and Red Bull occupying the top four spots at the end of Friday practice in Turkey, but concerns will once again be raised over the reliability of the fastest car in the sport. Sebastian Vettel's day was beset with niggling problems, but Mark Webber's failure in the dying moments will surely cause the most concern for the Milton-Keynes based team - and equally give the opposition some hope. What looked to be a shoe-in for Red Bull no longer seems to be the case. We are certainly set for two very interesting days ahead. Can the RB6 stay in one piece? Join us tomorrow here on AUTOSPORT Live from 07:45 GMT as the intriguing story of Turkey 2010 continues.